I’m not a chess grandmaster. In fact, after five or so games of Chess Ultra, my success rate is 25%. I’ve captured fifty pieces exactly, and my Elo rating is 1,171 [EN: lol]. But, I now know what an Elo score is — in other words: I’m improving. Chess Ultra is everything I never knew I needed in a chess video game. I can play the computer at ten different difficulties, I can partake in online chess tournaments, I can study the comprehensive tutorials, or I can try their challenge section, filled with difficult chess “puzzles”; Chess Ultra is full-to-the-brim with more than you’d expect from a chess simulator. I say “simulator” because there’s also an included VR mode that advertises complete immersion into the atmosphere of a chess game (I say “advertises” because what you actually get doesn’t hit that mark). Everything from the basic movement of pieces to advanced game theory is presented thoughtfully and simply to players of any skill level. The best part of Chess Ultra is the tutorials. Sure, everyone knows that a pawn can only take a piece diagonally and knights move in funny “L” shapes, but I bet you don’t know anything about “The Italian Game” opening or the “en passant” manouvre. The tutorials are surprisingly in-depth and offer at least a couple hours of invaluable chess knowledge. Everything from the basic movement of pieces to advanced game theory is presented thoughtfully and simply to players of any skill level. I only intended to spend a couple of moments with the tutorials, just for review purposes, but I ended up spending the bulk of my time in that section. To anyone interested in learning how to play chess, I highly recommend Chess Ultra as strictly an educational tool. Another surprisingly fun section was the Challenges area. It mostly consists of “puzzles” in which you have to checkmate your opponent in a certain number of moves in a variety of different chess situations. Within that there are “Historic” puzzles that challenge you to take on the role of a famous chess player in some of the greatest chess matches of all time. Can you replicate Adolf Anderssen’s final five moves which beat Lionel Kieseritzky in the historic match in London on June 21st, 1851? The actual chess game modes play as expected: the piece movement is fluid, the A.I. is appropriately stupid at low levels, and the online games use your Elo for matchmaking. There are five different types of timers with which you can play and you can change the look and material of your chess pieces, as well as the arena type. As far as virtual chess goes, Chess Ultra sets the board. To be blunt, the VR mode of Chess Ultra is not fun. The game is poorly optimized and I had trouble even getting it to appear correctly in my space. I attempted to play a game from sitting on top of the table and I eventually gave up. 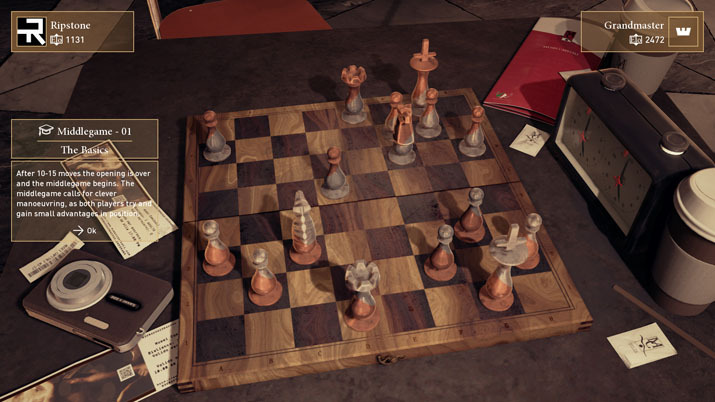 Especially when compared to other virtual reality chess experiences, if you’re looking mainly for VR chess, nothing really sets Chess Ultra apart (in a good way). Hopefully, these are things that can be corrected in the future. Graphically, Chess Ultra looks beautiful. The few arenas in the game are all designed beautifully, and are immersive and non-distracting, from the casual upper-class apartment venue to the biblically inspired “Gammorah.” The music in Chess Ultra is “thought-provoking,” and the sound effects are just fine. Occasionally, in the ‘upper-class apartment’ arena, a nearby cell phone vibrates. I can’t decide if I would consider this a well-placed, finer detail, or an unnecessary distraction, but I found it to be amusing in the few times I encountered it. Chess Ultra is a fantastic entry in the world of virtual chess. While its actual chess gameplay isn’t revolutionary in any shape or form, its entertaining tutorials and challenge modes make it a worthwhile play for beginners and experts. 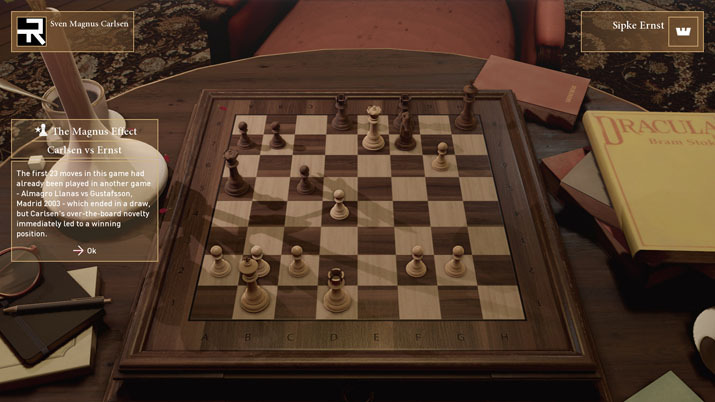 Those looking for chess in virtual reality, however, might want to look elsewhere; Chess Ultra, as a package, is extremely well done and delivers much more than is expected from a chess title. Except the VR aspect. Please avoid that.